The perfect chicken wing is an excellent accompaniment to a variety of events: while you’re watching the big game, you’re out with a big group of friends for the night, or if you’re simply looking to indulge yourself in a guilty pleasure snack. 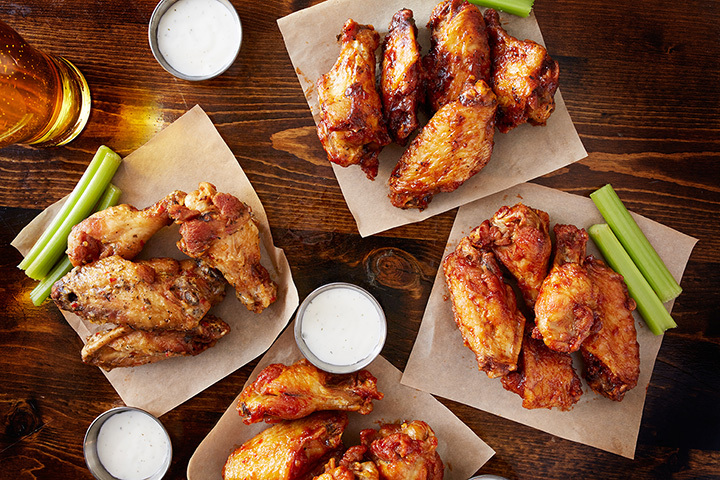 Check out the following chicken wing joints in Texas to dazzle your taste buds. Wing Town and Grill in Carrollton, Texas, serves Buffalo chicken wings, burgers, fish, and sandwiches. Wings are never breaded—instead, they are tossed in your choice of sauce. Sauce options include Cajun, original hot, mild, Caribbean hot, spicy barbecue, honey barbecue, teriyaki, lemon pepper, honey mustard, and garlic parmesan. Wing City is one of Garland, Texas’s favorite wing spots. The self-styled “Wing Pros” promise that their wings are always fresh, and sell them in six or ten piece amounts. If you’re particularly hungry, you could swing for the 25, 35, or 50 pack, too. With ten fantastic flavors, including a fantastic Cajun Dry Rub, you’ll have plenty to write home about. Wing Bucket has two Texas locations, one in Dallas and another in Richardson. At each location, they use “a unique cooking process and the use of only fresh and jumbo size chicken wings, tenders, and pork ribs.” Choose from 21 different flavors, including Mike’s P.B. & J, and add fresh-made sides to give yourself a meal you won’t soon forget. Wings Plus in Corpus Christi, Texas is the “Home of the famous Bulgogi Burger,” in addition to their mouth-watering wings. They have over 200 wing flavor combinations to choose from, including 911 (hot) and Double 911 for those who like a challenge. Wings n More has four unique locations, three in College Station and one in the Woodlands, Texas. They sell wings, ribs, seafood, entrees, and combos. We recommend the Wing ‘N’ Rib sampler, served with five wings any style you like and ranch or bleu cheese and four sweet and tender honey-glazed ribs. Sauced Wings in Allen, Texas, has several events throughout the week that make them note-worthy. On Mondays, stop by for a $5.99 burger special. Sunday is Happy Hour prices all day. Thursday is Family Night, with free meals for kids under 10. And Wednesdays, the holy grail, is wing night, with $0.88 bone-in wings. If you’re looking for an “exotic” sauce, try their sweet Thai chili. Don’t try the Instant Death wings unless you’re willing to suffer the consequences. Buffalo Wings and Rings has a staggering 13 locations scattered throughout Texas. Locations include Weslaco, New Braunfels, Round Rock, San Antonio, McAllen, Mission, Edinburg, Hidalgo, Laredo, Dallas, Brownsville, and Del Rio. Everything about Buffalo Wings and Rings is catered to give you the ultimate VIP sports-watching experience. And the wings are good, too. USA Today recently recognized Pluckers as one of the “Top 10 Wing Bars in the United States.” ESPN ranks them in the Top 5 Sports Bars, too. Therefore, it would be simply criminal of us not to include them on our list. With locations in Austin, Baton Rouge, Dallas/Fort Worth, Houston, Killeen, and San Marcos, it’s easy to see how Pluckers became so popular. USA Today recommends the Baker’s Gold wings and who are we to argue? They’re amazing. Austin’s Tavern might be serving up the best wings in the state. This historic joint was first opened in 1933. The menu features a selection of chicken wing options such as their “Amazing White Wings,” which are wrapped with bacon, jalapenos, and tossed in a wing sauce, or their regular Buffalo wings tossed with your choice of Buffalo sauce, teriyaki, or sweet chili.